Thomas Eakins (1844–1916), The Biglin Brothers Racing (1872), oil on canvas, 61.2 × 91.6 cm, The National Gallery of Art, Washington, DC. Wikimedia Commons. 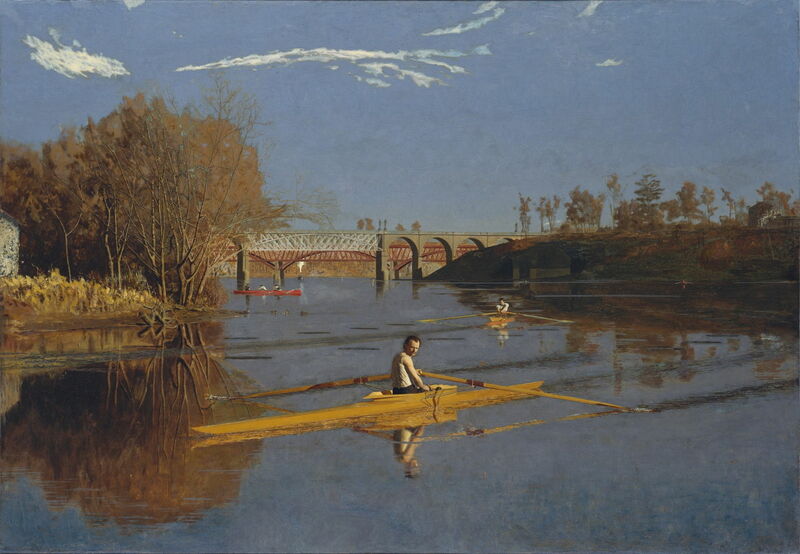 When first shown to the public in Philadelphia in 1871, Thomas Eakins’ astonishing painting The Champion Single Sculls (often known as Max Schmitt in a Single Scull) (1871) was described by one critic as “peculiar”. The public seemed unprepared to see such a modern sport portrayed in a work of art. Eakins was not the only painter, though, to break new ground in making novel watersports their theme: before the end of that decade, three other major artists had followed suit. 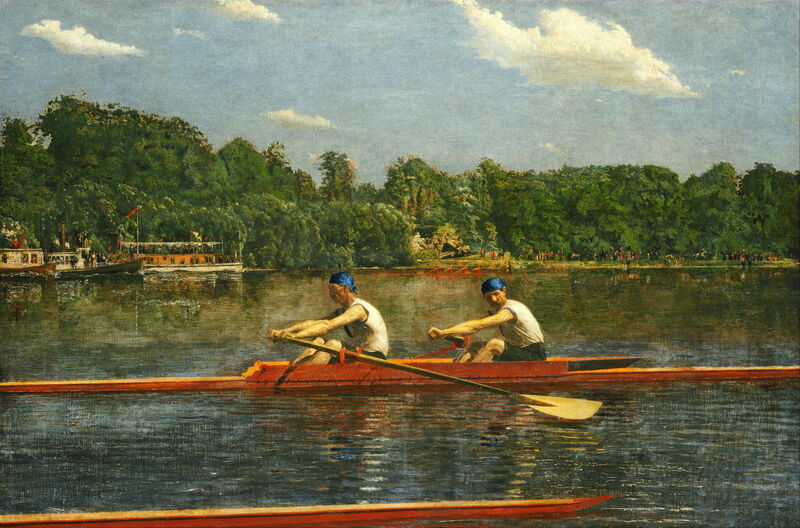 This article looks at the appearance of rowing and related sports in paintings at that time. Rowing as a means of transport has long been an accepted and conventional theme in art, from idyllic couples on calm backwaters to Charon’s ferry of the dead across the Styx and Acheron. There were a few places where rowing races were held, but it wasn’t until the mid-nineteenth century that rowing became an established sport. Among the oldest events is the Boat Race, between crews from Oxford and Cambridge Universities, and held on the River Thames, which was inaugurated in 1829, and became annual from 1856. A decade after the first of those races, Henley Royal Regatta (also on the River Thames) was established. In the US, the Harvard-Yale Regatta started in 1852, and has been held annually since 1859. 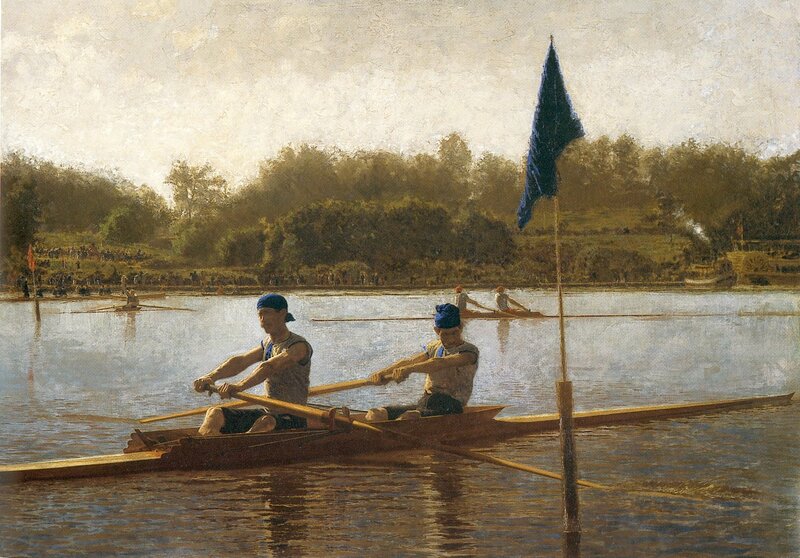 The Head of the Schuylkill Regatta, held in Eakins’ native Philadelphia and the scene of his paintings of rowing, first took place in 1874, just after he had completed these paintings. One of the major factors in the popularisation of such watersports was the application of technology to the construction of small boats. Until the introduction of plywood in around 1865, rowing boats were of clinker construction, making them both heavy and expensive. Manufactured plywood was much lighter, cheaper, and could be moulded in factories: relatively low-cost, lightweight boats then became readily available. Recreational boating and the sport of rowing were thus signs of the technological, social, and manufacturing changes which took place in the nineteenth century. The Champion Single Sculls (Max Schmitt in a Single Scull) (1871) marked Eakins’ debut as a professional artist, following his training in Paris and Spain. It was the first of a series of paintings which, even today, are startling in their very precise and geometric realism. 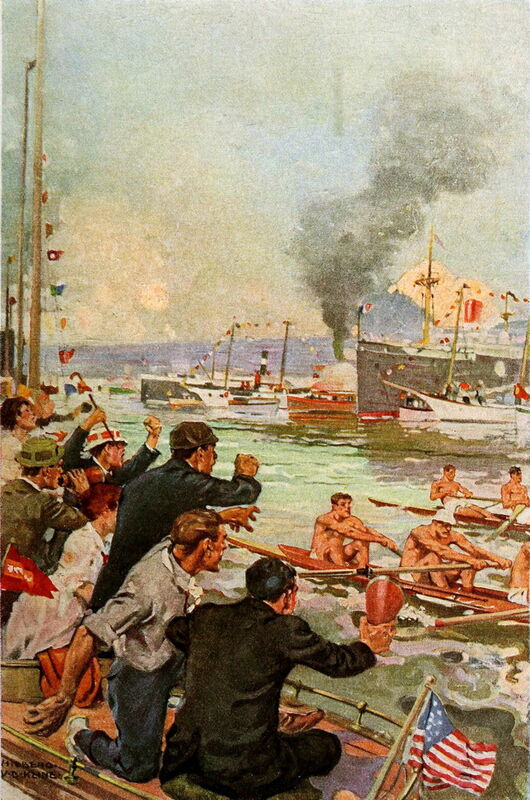 Not only is it centred on this novel sport, but in the background other fruits of modern engineering are on display, in the form of two modern bridges, and a steamboat. In Eakins’ riverscape, the artefacts of man are starting to dominate over the trees, even the river itself. The following year, his The Biglin Brothers Racing (1872) was less dominated by artefacts, with its broad belt of woodland, but more about the two brothers and their motive power. Instead of a single man in a scull (pulling a pair of oars), the brothers row a pair, each with a single oar, working as a team. In the distance is a coxless four, dependent on a larger team. Thomas Eakins (1844–1916), The Biglin Brothers Turning the Stake (1873), oil on canvas, 101.3 × 151.4 cm, Cleveland Museum of Art, Cleveland, OH. Wikimedia Commons. The Biglin Brothers Turning the Stake (1873) sees them further along the course, making the turn at one of its markers. In the background is another steamboat, and the stern of a paddleboat. Thomas Eakins (1844–1916), John Biglin in a Single Scull (1873), watercolour, 42.9 × 60.8 cm, Yale University Art Gallery, New Haven, CT. Wikimedia Commons. 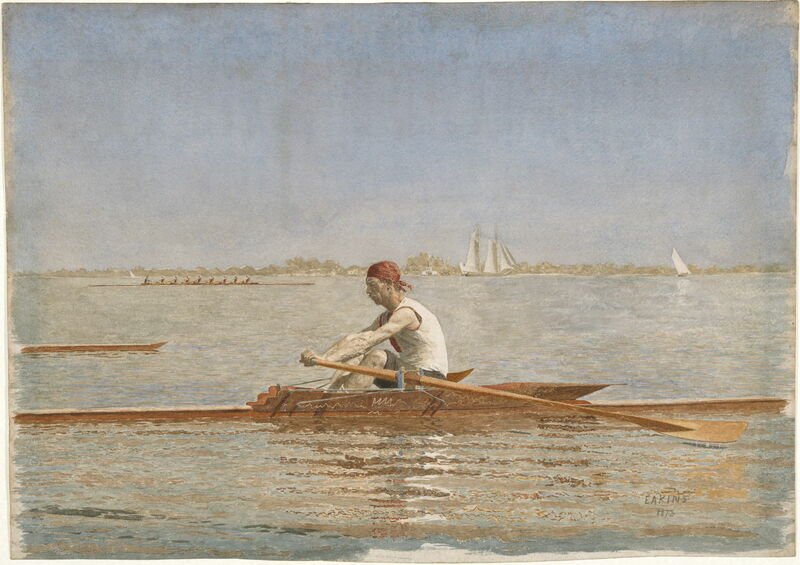 Eakins’ later watercolour returns to the lone sportsman pulling both oars, in his John Biglin in a Single Scull (1873). In the distance is a (coxed) eight, and a couple of sailing vessels. 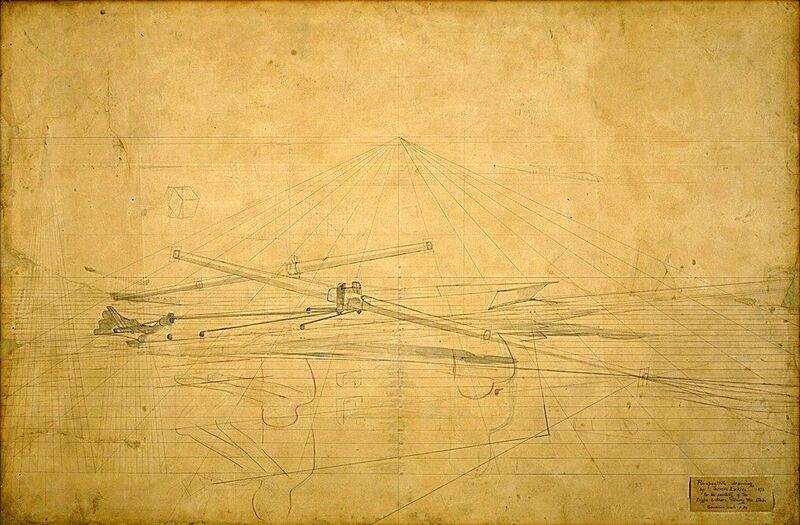 Thomas Eakins (1844–1916), Perspective Drawing for “The Biglin Brothers Turning The Stake”, graphite on paper, dimensions not known, The Hirshhorn Museum and Sculpture Garden, Washington, DC. Wikimedia Commons. As this meticulous perspective drawing shows, Eakins constructed these paintings with great attention to detail, just as the boats shown were carefully designed and manufactured. At this stage, he did not use photographs as an aid, but went on to develop a system for capturing images of human and animal motion, and for projecting images for use in painting. Alfred Sisley (1839-1899), Regattas at Molesey (1874), oil on canvas, 66 x 91.5 cm, Musée d’Orsay, Paris. EHN & DIJ Oakley. 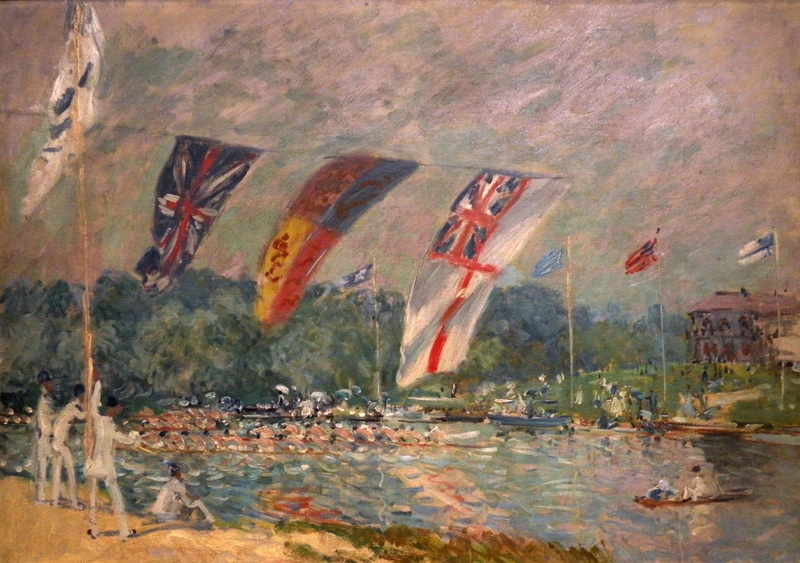 Quite independently of Eakins, during a visit to England in 1874, Alfred Sisley painted Regattas at Molesey, which shows the colour and activity at one of the River Thames’ smaller rowing regattas, at Molesey in Surrey. This was established in 1867, with the huge growth in popularity of rowing as a sport. Gustave Caillebotte (1848-1894), Périssoires sur l’Yerres (Skiffs on the Yerres) (1877), oil on canvas, 88.9 x 116.2 cm, National Gallery of Art, Washington DC. WikiArt. Gustave Caillebotte was an avid racing yachtsman who owned his own boatyard, and painted the rapid growth in watersports on the rivers around Paris. 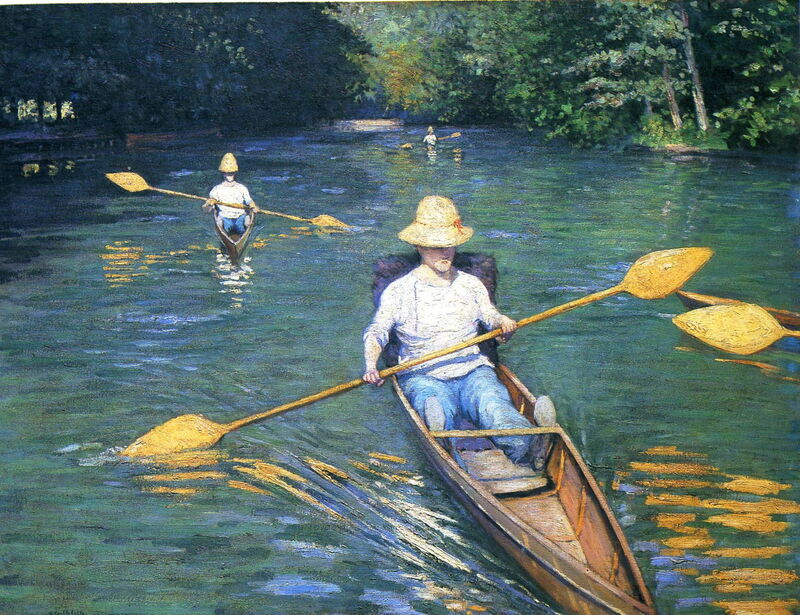 Although his Périssoires sur l’Yerres (Skiffs on the Yerres) (1877) is more leisure than competitive sport, and its participants use paddles rather than oars, it has much in common with Eakins’ sculls. Here the bourgeois are out enjoying some time on the river – a very nineteenth-century phenomenon. Pierre-Auguste Renoir (1841–1919), Les Canotiers à Chatou (The Boating Party at Chatou) (1879), oil on canvas, 81 × 100 cm, The National Gallery of Art, Washington, DC. Wikimedia Commons. 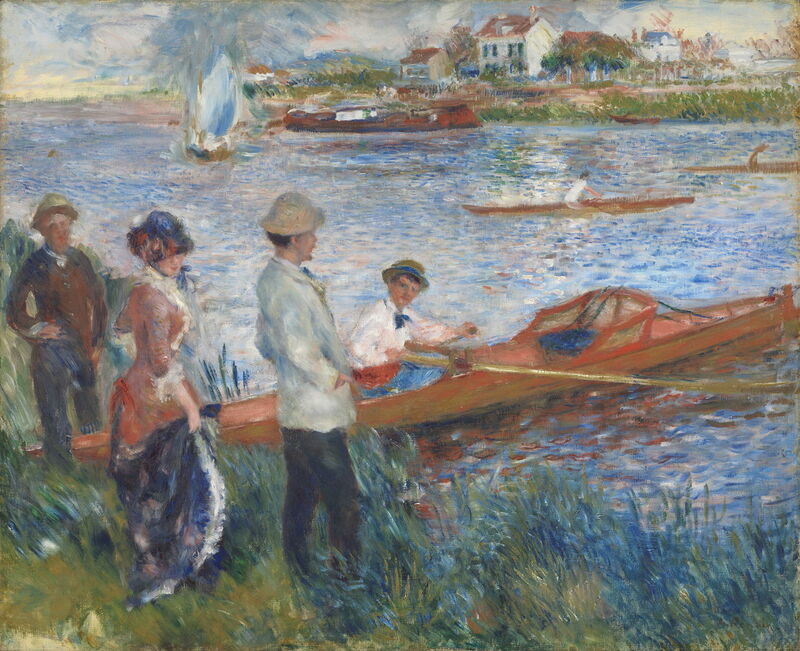 Renoir’s Les Canotiers à Chatou (The Boating Party at Chatou) (1879) captures both social rowing in the foreground, and two sports rowers further out in the River Seine. The latter are most probably in single sculls, just as shown by Eakins. Although Renoir is likely to have seen at least one of Caillebotte’s paintings of boating on the Yerres, neither are likely to have been aware of Eakins’ paintings. After this flurry of paintings in the 1870s, it would appear that the novelty of rowing and related watersports wore off. There’s the occasional glimpse in some of the waterside paintings of the Divisionists (Pointillists) rather later, but nothing to compare with Eakins, Sisley, Caillebotte, and Renoir. Unknown, Lady Sculler (1900), published in Le Figaro Illustré, July 1900. Wikimedia Commons. 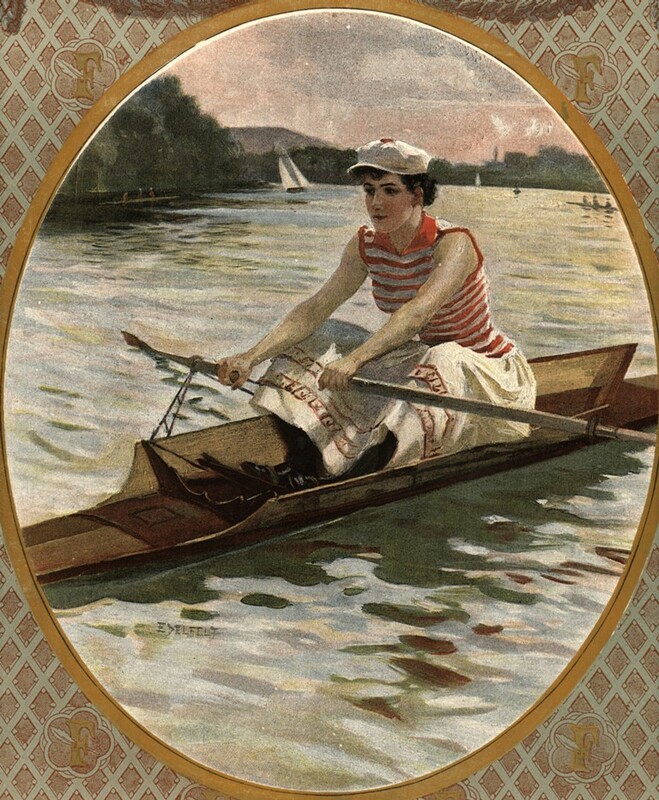 As this illustration from Le Figaro Illustré in the summer of 1900 shows, as attitudes towards women gradually changed in society, even the Lady Sculler became acceptable. Hibberd Van Buren Kline (1885-1959), Pride of Youth, 3: Pull, You Beggars, Pull (1910), published in The Outing Magazine, 1910. https://archive.org/stream/outing56newy#page/n174/mode/1up, via Wikimedia Commons. Of course, different standards of dress applied to the men shown in Hibberd Van Buren Kline’s Pride of Youth, 3: Pull, You Beggars, Pull, which was published in The Outing Magazine in 1910. Anthony Conway (1961-), A Declaration of Interdependence (c 2001), mixed media, 88.9 x 259.1 cm, location not known. Photo by Niknakc, courtesy of the artist, via Wikimedia Commons. Anthony Conway (born 1961) is a modern realist who has in many respects followed in the footsteps of Eakins. It’s therefore only appropriate that he should have painted A Declaration of Interdependence (c 2001). These boats are now made from carbon fibre composite materials, but the demands on their crews are just the same. Lloyd C, Charles D and Cate PD (2013) Impressionists on the Water, Skira. ISBN 978 0 8478 4025 0. Posted in General, Painting and tagged Caillebotte, Conway, Eakins, Kline, painting, regatta, Renoir, rowing, scull, Sisley, skiff, watersports. Bookmark the permalink.